Whether you live in Berlin or you are planning a trip, the capital offers many leisure activities for everyone. Berlin is a very popular city to visit and there are many different things to choose from. At CeleBreak, when we are not on the pitch we are always looking for fun and outdoor activities. Berlin is one place that offers so many making it hard to choose from. 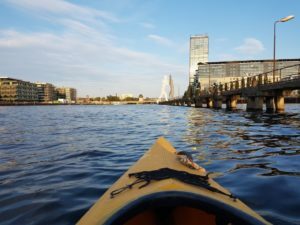 With that being said, we created this list of the outdoor activities in Berlin you should check out. Paddle your way through the famous waters of Landwehrkanal and the Spree River. This is a great way to see the city at a different perspective as it offers many views that walking on land simply does not allow you to see. A tour guide will take you and a small group through the waters and educate you in on some of the history and facts about the city and its attractions. 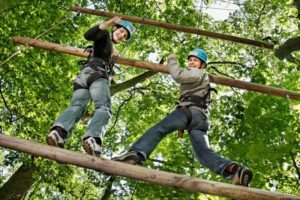 Take your adventures to new heights with this forest climbing course. There is something here for everyone to enjoy due to the three children’s courses and nine courses for adults. The courses are labeled with their difficulty so you know what you will be going up against. You can take on this experience from March through October and the staff speaks many languages which makes communicating about the safety aspects easily understood. To find out more, visit their website! Berlin has so many amazing parks making it difficult to choose one to visit. Despite that being said, the Gardens of the World is definitely one worth exploring. There are 10 international gardens covering an area around the size of 60 football pitches. Here you will find international representations of Japan, Bali, China, Korea, Italy, and the Orient. 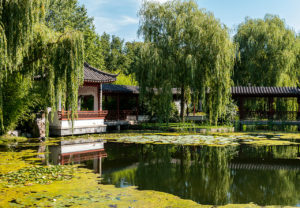 There are many exotic plants, greenery, water features, and unique structures. You can also enjoy tea ceremonies in the Chinese, Japanese, and Korean tea houses. If taking a walk through the garden wasn’t enough, the IGA cableway allows you to take a look from a bird’s-eye view. Getting a bike and riding through the city is extremely popular to do in Berlin. Being able to explore what they city has to offer on a bike is extremely relaxing and enjoyable. You can either rent one and explore yourself or have a guided tour where the guides will bring you to many of the top places to see. 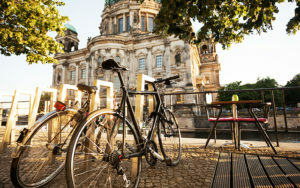 For instance, you will see the boulevard Unter den Linden and the Brandenburg Gate as well as riding through the streets of Gründerzeit and along the Berlin Wall. For those who want to explore on their own, there are many places all over the city you can go. Most are in Mitte, Kreuzberg, Friedrichshain or near the Zoologischer Garten station. For a day, you can rent a bike for around €12 euros depending on the bike you choose. When visiting a city like Berlin that has extraordinary landmarks and various gardens, going on a hike may not even cross your mind as a possibility. However, Berlin has some amazing hikes offering spectacular views that are definitely worth seeing. 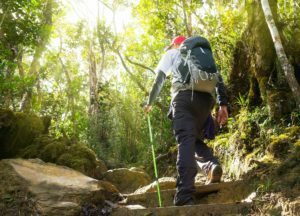 There are about 251 hikes in and around Berlin giving those who want to explore a numerous amount of options. Although choosing one may be difficult, down below are a few websites you can check out for trials and routes you can take. Happy hiking! Combine flying a kite and skateboarding and there you go, Kite Landboarding. Many riders are found at Tempelhof Field which was originally an airport that later turned into a public park. Today, there are six kilometers available for cycling, skating, jogging, a 2.5-hectare BBQ area, a dog walking field that’s about four hectares and a picnic area. Kite Landboarders like using this area due to the open land, which makes it a perfect area to learn it too. 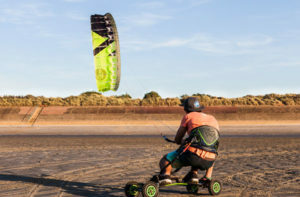 You may never have heard of Kite Landboarding but it makes a great outdoor activity to try while in Berlin! Lessons are available all year long through Berlin-kite School. For the warmer months, you could also try Kite Surfing, also available through Berlin-kite School! For those who want an adrenaline rush, we got you covered. In Berlin there are lots of great spots for houserunning, bungee jumping or base flying. First, houserunning is where you are running on the side of a building instead of free falling, which makes it a step down from the other two . The length of the course varies and you will be completely secured during your whole trip. If this isn’t enough excitement, then bungee jumping and base flying are the next steps up. Prepare yourself has you get ready to jump off the side of a building and free fall! There are many areas that offer this, even some that have ‘dip-ins’ where you fall into water. Lastly, base flying is another option which is slightly different because you will be strapped in harness instead of having bungees attached to your ankles. Many have said that the Park Inn Hotel at Alexanderplatz is a very good spot to jump. Visit this website for more information and bookings on any of these three activities. Do you want more outdoor activities? Play some football! There are various outdoor activities in Berlin. Before you complete your list of activities to do while in Berlin, make sure to fit in some football too! At CeleBreak, we organise pickup football games available to anyone at times that work best for you. It’s that easy. Download the app, pick your location, pick a time that works for you, and join a team.